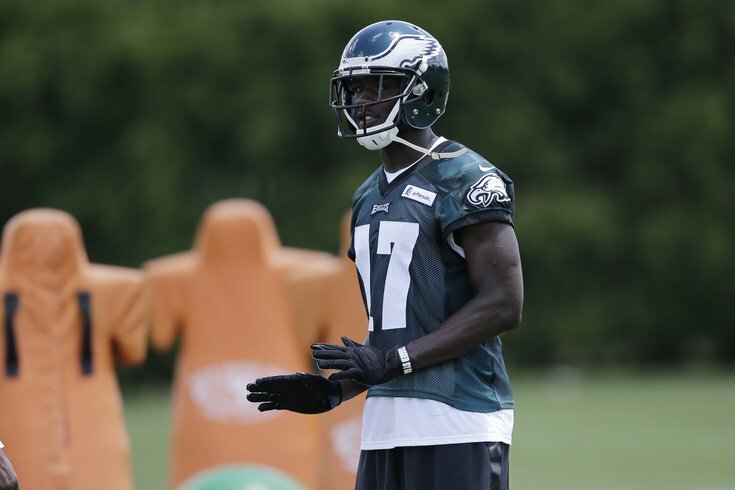 Philadelphia Eagles' Nelson Agholor after NFL football minicamp, Wednesday, June 17, 2015, in Philadelphia. We're a few months past the draft at this point, but over the last few months we've been comparing each of the Eagles' rookies to current NFL players. In case you missed any of them, you can read the full series here. Many people compared Agholor to Jeremy Maclin and Reggie Wayne, but the comparison I like the best is the Broncos' Emmanuel Sanders. Daniel Jeremiah of NFL.com first made that comparison way back in February. Agholor and Sanders are both smooth athletes who make hay as excellent route-runners. They possess the toughness to work in high-traffic areas of the field and are also slippery after the catch. Sanders was a draft-day steal by the Pittsburgh Steelers back in 2010, selected in the third round at No. 82 overall. With a stacked group at wide receiver for the second consecutive draft, Agholor will be a great value pick when he likely comes off the board in Day 2. Here's Agholor's game against Cal last season in which he had 16 catches for 216 yards and 2 TDs, plus a 78-yard catch and run that was called back on a holding penalty. And here's Sanders' highlight reel of a year ago, when he caught 101 passes for 1404 yards and 9 TDs for Denver. Jeremiah is on the money when he notes both players' willingness to work in traffic, and I love the word "slippery" to describe them after the catch. Arm length 32 1/4" 32"
Hand size 9 1/4" 9 1/4"
In terms of career path, this is a comparison that does not quite fit, in my opinion. Sanders is heading into his sixth NFL season, and while he made the Pro Bowl in 2014, it took him some time to become the player he is. I think Agholor is already a polished receiver who is ready to contribute immediately and do not think it will take anywhere near as long for him to produce as it took Sanders. • Devin McCourty, Patriots: Huh? I get that McCourty has played corner and safety like Rowe, but McCourty is 5'10. Rowe is 6'1. Those are two completely different body types. • Casey Hayward, Packers: Hayward is a slot corner, or at least he has been so far in his three year career with Green Bay, although he may move outside this season. Rowe is going to play on the outside at corner. And again, like McCourty, Hayward does not have Rowe's length, while Rowe hasn't shown Hayward's ball hawking skills, as he had just three career INTs in college. • Pierre Desir, Browns: This one I like to some degree, via Lance Zierlein of NFL.com. Desir is a big, physical corner like Rowe, so the the comparison is apt in that regard. However, Zierlein did most of his comparisons prior to the NFL Combine, and Rowe's performance there revealed athletic measurables that surprised a lot of people. Desir does not have Rowe's athleticism. • Aqib Talib, Broncos: Talib makes sense. He's 6'1, 205, and ran a 4.44 40 back in the day at the 2008 Combine. Rowe is also 6'1, 205, and he ran a 4.44. So their basic physical measurables match up nearly identically. Both players are also physical corners. However, Talib has always been a corner, whereas Rowe offers positional versatility. Talib was also a ball hawk both in college and in his first few years in the NFL, while that is a part of Rowe's game where he could stand to improve (again, just three INTs at Utah). So who do I like as a comp for Rowe? Former Chargers corner Quentin Jammer. First, let's look at Rowe's and Jammer's Combine measurables. • Size-speed measurables: As noted above Rowe's and Jammer's Combine measurables were very similar. To expand on that a tad, I think some would argue that Jammer didn't play to his timed speed. That will also be something Rowe has to prove he can do. • Versatility: Rowe had a rare transition from safety to corner in college. He played safety his first three years at Utah before moving to corner for his senior season. Similarly, Jammer started his college career at Texas at safety before moving to corner. • Physical play: Jammer was a physical press corner, and a very solid tackler, as is Rowe. • Lack of splash plays: Over his 12 year NFL career, Jammer had just 21 interceptions. In his four year college career, Rowe had just three interceptions. There have been some positive signs here in the early going. Undlin pointed to "an unbelievable play" Rowe made on Wednesday that speaks to his level of growth in a short period of time. The new defensive backs coach didn't want to offer up too many specifics, but explained that based off the offensive formation and split of the wideout, Rowe properly diagnosed the situation and made a call that put the defense in position to have the upper hand. "Actually, it was really impressive," he said. Jammer is no longer playing in the NFL, which means that technically he's not exactly an "NFL comp," but I like it better than the others, so too bad. This may seem a little lazy, but the best player I came up with for a Jordan Hicks comp was current Eagles ILB DeMeco Ryans. I promise I tried to come up with a less familiar name, but Ryans was my favorite comparison of the players I considered. Ryans has since slowed down because of injury issues, but coming out of college at Alabama, Ryans measurables that were very close to Hicks'. Chip Kelly called Ryans "Mufasa" after he went down with an injury last year, in that Eagles players would rally and play in his honor. "There's not just one thing that stands out (about Ryans)," said Kelly in a separate interview. "I think his approach to everything; I think he's exactly what you want in a professional in terms of the hours that he puts in here, how important the game is to him, how much he studies just the game of football, how he trains when he's in the weight room, what he's like on the practice field. I think there's a consistency to him that I think separates kind of the great ones from everybody; it’s that he's the same person every single day here. "He's always a calming influence, he doesn't lose his mind on game day, but there's a calm intensity about him in everything he does. I think we try to get our younger guys to understand that if you want to know what a football player looks like, watch DeMeco and how he handles himself, not only on the field, not only in the training sessions, but 24 hours a day." Smart and loves the game of football. Scouts say the staff at Texas raves about the way Hicks lifts, prepares for games and takes care of his body. Has football character in spades. "He'll probably be a coach after he's done with football. He loves it that much." However, the negatives on Hicks are that he ""plays through a straw, seeing just what is in front of him," and he "rarely free-styles and takes chances." To some degree, I think the same can be said of Ryans. For his nine year career, Ryans has a shockingly low six forced fumbles and six interceptions. Hicks' "big play" stats in college are just as unimpressive. For his college career, he had just two interceptions, and no forced fumbles. Both players also have a history of serious injuries. Both Hicks and Ryans are smart, highly respected leaders who basically serve as coaches on the field. They'll make the plays they are supposed to make; just don't expect many splash plays. The most obvious takeaway from Shepherd's tape is how many footballs he gets his hands on. In fact, Shepherd had more pass breakups over the last two years than any other cornerback that was selected in the 2015 NFL Draft. And it's not as if Shepherd is only getting a ton of PBUs because he was targeted so frequently.According to PFF, Shepherd also had the lowest percentage of targets completed against him among all drafted CBs in the 2015 draft, at just 38.6%. Some corners have a knack for locating the football and making a play on the ball. Some don't. Shepherd does. So why was he drafted in the sixth round? Well, one reason could be the awful 40 times (4.65 and 4.68) he ran at his pro day. Shepherd said he ran those times with a torn hamstring, so perhaps the Eagles will be beneficiaries of his injury. Still, Shepherd was not thought to be a blazer with a pair of healthy hamstrings. • Unimpressive measurables: Like Shepherd, Hyde doesn't have much in the way of impressive measurables. Hyde measured in at 6'0, 197 at the Combine, which is an inch taller and couple pounds lighter than Shepherd. He ran a slow 4.56 40 time. However, also like Shepherd, his game tape is better than his measurables might suggest. • Ball recognition: In Hyde's final season at Iowa, he had 14 pass breakups, which is what Shepherd averaged over his last two. Hyde also caught my eye during the 2013 East-West Shrine Game practices, when he was batting down passes all over the field. • Slot corners: Hyde is projected going forward to be the Packers' slot corner, which makes sense because of his lack of long speed. During OTAs, the Eagles had Shepherd mirroring Brandon Boykin in the slot to learn the checks Boykin was making. • Return ability: Despite their unimpressive timed speed, Hyde is a good returner in the NFL. Shepherd may or may not return kicks/punts at the pro level, but he did it at Kansas. • Sure tacklers: Shepherd is by no means a stud against the run, but he's an effective enough tackler who will get the ball carrier to the ground, and will occasionally lay a nice hit on receivers. Hyde is better (and more physical) against the run than Shepherd, but they're both willing tacklers. • #Culture: Hyde was thought to be a leader on his Iowa teams, and he was an Honor Roll student. And as with just about any Eagles draft pick these days, Shepherd is absolutely a "character guy." • Height-weight: Both players came out of college listed at 6'0, 195. Graham was a fifth-round pick, Evans a sixth. • Ball skills: Over the last two seasons, Evans broke up 22 passes, which was fourth among all CBs that were selected in the 2015 NFL Draft. In 2014, Graham was tied for third in the NFL with 11 pass breakups (per PFF). • Physical run defenders: Evans made a boatload of tackles at Kansas State: 64 in 2014 (3rd on his team), 59 in 2013 (6th), and 77 in 2012 (3rd). That would be 200 tackles over three seasons. In 2014 with Buffalo, Graham finished second in the NFL among cornerbacks with 84 tackles. He has had 218 tackles over the last three seasons. • Positional versatility and special teams contributions: "The unique thing about him is he's played safety, he's played nickel, he's played corner," Chip Kelly said at his post-draft press conference about Evans. "He's a physical player. He's an outstanding special teams player." Similarly, Graham has the versatility to play both on the outside and in the slot, and he made the Pro Bowl after the 2011 season with the Bears as a standout special teamer. Graham has become an excellent starting corner in the NFL late in his career, and is one of more underrated players in the league. If Evans can carve out a career that is close to Graham's, that would be a big win for the Eagles. Mihalik was by far and away the most difficult draft pick to match up with a current NFL player, simply because of his dimensions. Mihalik is 6'9, 302, which is a very tall, slender frame for a 3-4 DE. There aren't many NFL players with a similar body. There's Arizona's Calais Campbell, who lists at 6'8, 300, but to compare Mihalik to Campbell would be entirely unreasonable, as Campbell had a very good college career and is among the best 3-4 DEs in the NFL. The other player who makes a lot of sense from a height-weight standpoint is the Titans' Ropati Pitoitua, who stands at 6'8, 298, but my buddy Tommy Lawlor of IgglesBlitz.com is already making that comparison for his piece the Eagles Almanac, so I won't duplicate that. Otherwise, there isn't much left to choose from, in terms of tall, sleek interior defensive linemen with outstanding athletic ability. For Mihalik, we'll eschew our efforts to find a player who mirrors his body type / athletic measurables, attributes, and production like we did with the other Eagles rookies, and we'll make more of a general comparison. It's pretty remarkable that Mihalik's measurables compare that favorably with an elite athlete such as Okoye, especially at a height of 6'9. However, both guys are projects as football players.